A MINI estate, both in name and stature, the Clubman brings some additional space to the MINI, but don't expect to be slinging wardrobes in the back - unless they're from a dolls house. A MINI estate, both in name and stature, the Clubman brings some additional space to the MINI, but don't expect to be slinging wardrobes in the back - unless they're from a dolls house. Created in response to criticism that the MINI hatchback was a bit short on practicality the Clubman gave young families a bit more versatility. The five-door layout is rather unconventional, with two rear boot doors, a pair of doors on one side and a single door on the other, but still useful. The Clubman line-up largely followed the hatchback range, being offered with petrol 1.6-litre engines in the One and Cooper, the Cooper S gaining a turbocharger. By far the biggest seller was the diesel though, the 1.6-litre four-cylinder turbodiesel, offered in both standard One D and go-faster Cooper D guises. More practicality came via a slightly longer wheelbase, meaning a little more space in the rear for both passengers and luggage. To say that MINI took an unconventional approach to the Clubman's doors is something of an understatement, as the boot is opened via a pair of barn-style doors, while a small additional, rear-hinged side door on the driver's side improved access to the rear seats. The boot isn't vast, but it'll swallow a buggy at a push, if not much else. That side door is useful, though it's on the wrong side of the car if you prefer to park the passenger side to the kerb. The rear doors do mean there's a large pillar in the centre of your rear view mirror, which can make parking tricky. Look for cars fitted with parking sensors then. Otherwise it's all regular MINI, which means a finely finished interior, lots of kitsch-retro details and a decent level of standard specification. All will come with air conditioning, though MINI's large personalisation program means it's unlikely two cars will be the same. The Cooper D is the most common, as the One D didn't arrive until later in the Clubman's life. The Cooper D is our choice too, mixing good economy with performance - and a bit more practicality over its regular hatchback relation. There's an automatic option, but we'd pick the manual - a six-speeder. The Clubman is a more practical MINI. Only marginally mind, as virtually any ordinary supermini is more spacious - for passengers and luggage. 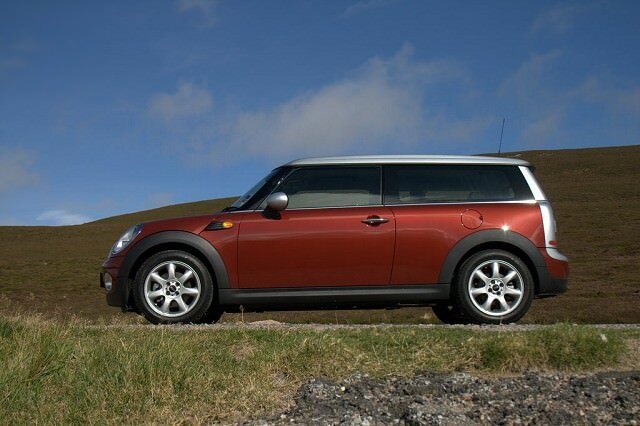 Still, if you absolutely have to have a MINI, but need a useable boot, then the Clubman's worth a look, and as fun to drive as its regular hatchback relations.